Learn a bit about the Year of the Sheep in my newsletter! 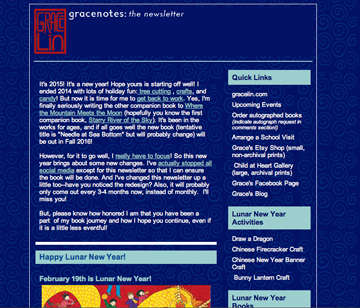 The Winter and Lunar New Year edition of my newsletter is now out! Learn a little bit about the Year of the Sheep, get a sneak peak at my new novel, and more! And if you want to be eligible for the free book giveaways, please sign up! As I said earlier, the newsletter will be my main outgoing source for now, so it would be great to have you onboard to keep in touch!